Microsoft’s corporate VP Nick Parker has revealed the first run of devices built specifically for Windows 10, from partners such as Asus, Toshiba and even FoxConn. The product reveal came at the end of the Microsoft keynote speech here at Computex 2015. The keynote covered much of what is already known about Windows 10, including demonstrations of Cortana, Edge and Windows Hello. Parker discussed some of the existing products that will be running Windows 10 when the upgrade arrives, before moving on to what he termed “the most exciting area”, featuring some of the new devices that have been built specifically for the new operating system, including a few that hadn’t been seen before. In all, nine new products were shown off, ranging from all-in-one PCs, tablets convertibles and some ultra-small form factor PCs. 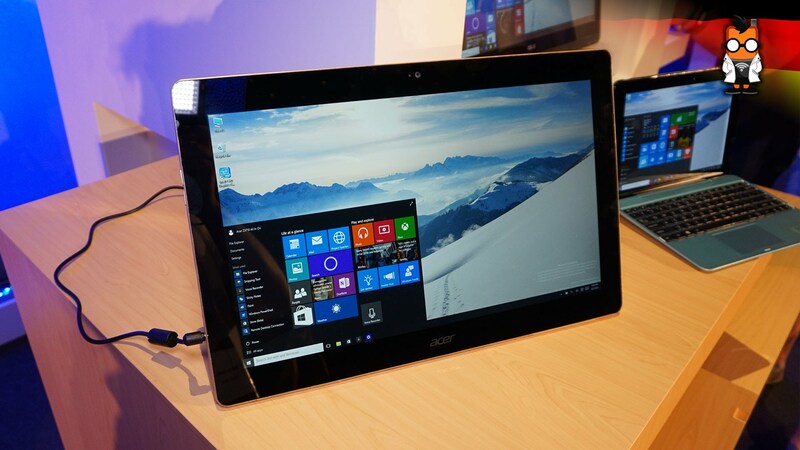 The two all-in-one devices were the Acer Z3-710, which is just 1.4 inches thick, and the Asus Zen AiO Z240. The Acer is a portable all-in-one with a built-in battery. Parker noted that all-in-one PCs had been a great “growth category” and that they were particularly well suited to Windows 10 in the home. Also from Asus was the Transformer Book T100HA a convertible two-in-one laptop with a detachable keyboard, weighing just 580 grams and measuring a svelte 8.45mm thick. A new HP x2 product was also on stage, it was was described as a “tablet-first” detachable product with a magnetic hinge design. The new x2 has Bang and Olufsen speakers and a metal finish. The Dell XPS 15 was also shown for the first time. This has the same InfinityEdge boarder less display as the glorious XPS13, although not much else was said about the device. Even less was said about the HP tablet. Other than the fact we know it’s a 9-inch tablet and made by HP, the only other information that it has a full size keyboard and “revolutionary” note-taking capabilities. Similarly an unnamed Toshiba two-in-one was mentioned, sporting a 4K display, Cortana optimisation and a “face-authentication camera” for Windows Hello. Parker said that as the Windows 10 launch date of July 29 edges closer, people should expect to see more and more products announced from Microsoft’s hardware partners, including more smartphones designed around the Window 10 mobile experience. Recent preview builds of the operating system of the Windows 10 continue to include many changes and a number of issues and bugs, the announcement hence encourages Windows 7 and 8.1 users to reserve their free upgrade with a notification in their task bar. Will you Tweet and Facebook to Save Mount Kenya?